January 2, 1955-September 1955. The show airs on NBC. September 1, 1955-September 19, 1957. The show airs on CBS. September 24, 1957-September 15, 1959. The show airs on NBC. September 3, 1997. Archive of American Television interview with producer Paul Henning. March 12, 2004. Archive of American Television interview with Ann B. Davis. December 17, 2004. 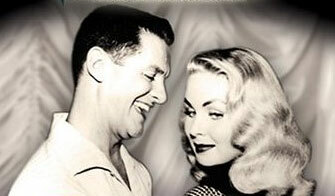 There is a book about Joi Lansing called Comfort and Joi by Joseph Dougherty. It is available at www.amazon.com. April 22, 2007. 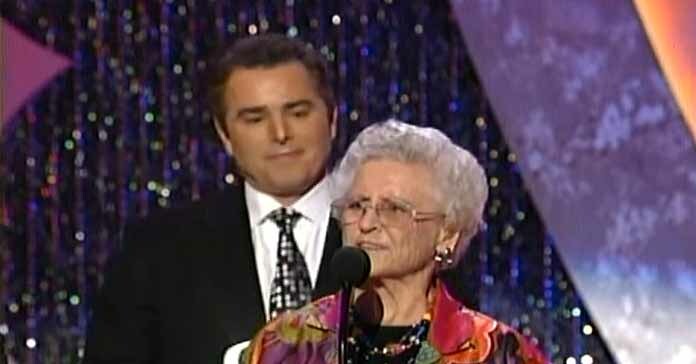 This is Ann B. Davis at the 2007 TV Land Awards when "The Brady Bunch" won the Pop Culture Award. Ann played the part of Alice Nelson on the show. The title change of the show to Love That Bob came later when it was moved to daytime and then into syndication. Bob Cummings played Bob Collins, a swinging bachelor and a professional beautiful model photographer. In his leisure time, Bob loved the ladies and had frequent dates with those gorgeous women. 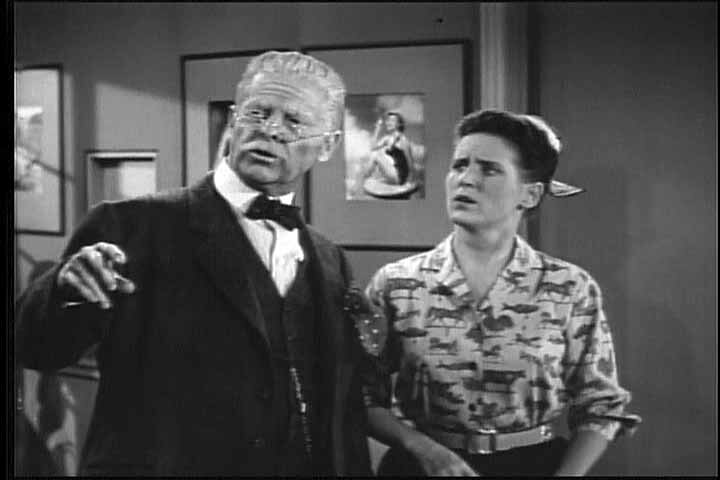 Bob's grandfather Josh Collins (also played by Bob Cummings) was up in years and lived in Joplin, Missouri (in real life this was Cummings' birthplace). 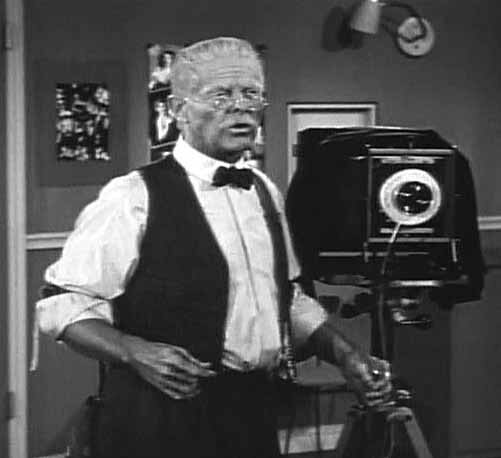 In this scene while Bob is away, Grandpa runs the camera in the photography studio. 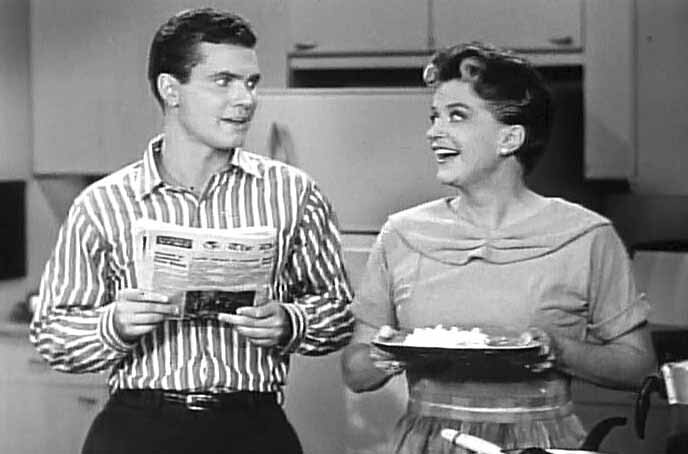 Bob lived with his widowed sister Margaret MacDonald (Rosemary DeCamp) and her son Chuck MacDonald (Dwayne Hickman). Bob's office assistant was Charmaine 'Schultzy' Schultz (Ann B. Davis) who added a lot of fun and comedy to the show. She's pictured here with Grandpa. Bob Goes To The Moon 4/1/58. Viewable online at the Internet Archive. Bob's Forgotten Fiancee 6/17/58. Viewable online at the Internet Archive. Bob and Schultzy Reunite 9/23/58. Viewable online at the Internet Archive. Bob Plays Margaret's Game 12/23/58. Viewable online at the Internet Archive. The record that Chuck dances to briefly sounds like a version of the closing credits of "The Life of Riley". It's 8:14 into the episode. Search for Love That Bob at the Internet Archive for more episodes that you can view online. According to Reel Media International, some episodes of this show are in the public domain. The Bob Cummings Show and Love That Bob are listed separately. Clarence Robert Orville Cummings was born in Joplin, Missouri. The actor played in romantic comedies and dramas. His first film role was as an extra in Sons of the Desert (1933). His career spanned over the 1930s through the 1970s. He won an emmy for his performance as a juror in Twelve Angry Men on CBS-TV's Studio One (9/20/54). He was into healthy foods and wrote a book called How to Stay Young and Vital. He had seven children and was married three times. His movie credits include Moon Over Miami (1941), Kings Row (1942), Saboteur (1942), Lost Moment (1947), Dial M For Murder (1954). 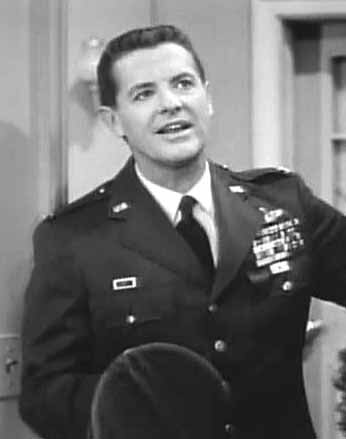 His TV credits include The Bob Cummings Show (1955-59) (1961-62) and My Living Doll (1964-65). Bob and actress Julie Newmar did not get along. He left with five episodes that needed to be shot. Robert Cummings was born June 10, 1908 and passed on, on December 2, 1990.